Let us suppose that the great empire of China, with all its myriads of inhabitants, was suddenly swallowed up by an earthquake, and let us consider how a man of humanity in Europe, who had no sort of connexion with that part of the world, would be affected upon receiving intelligence of this dreadful calamity. That's from Adam Smith's Theory of Moral Sentiments, published in 1759 no less. Thanks to Cafe Hayek for the link and timely reminder. 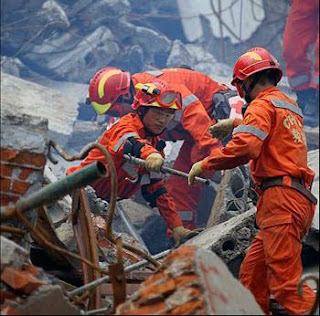 Oxfam Ireland are raising funds for those affected by the earthquake in China - you can donate here. Concern are raising funds for the victims of the typhoon in Myanmar - you can donate here.